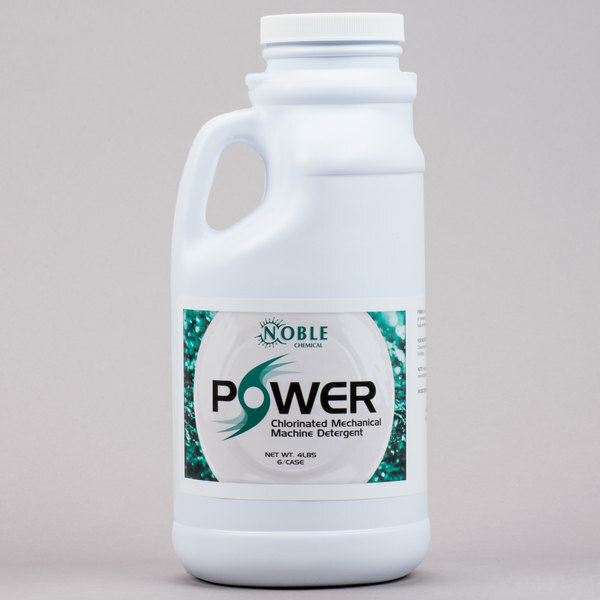 Designed for use in both commercial dishwashers and laundry machines, this dual-purpose Noble Chemical Power detergent helps outfit your operation with a sparkling, professional clean. The fast-acting formula is specially created for heavy soil loads and hard water conditions, ensuring the best possible performance in any restaurant, cafeteria, school, or hotel. For added convenience, this detergent comes in a 4 lb. container with integrated carry handle for easy transport from one location to the next. It is safe for use on all china and plastic dinnerware, and its highly stable chlorine solution boasts exceptional destaining capabilities! Dilute 1/4 oz. of detergent per gallon of water.